Tanzania is one of the unique destinations safari destinations on the African continent that has not yet been discovered by many. This Africa safari destination is a land of many wonders that harbors untouched diversity of fauna and flora. Tanzania is also home to several attractions including Mount Kilimanjaro; the highest permanently snow-capped free standing mountain in Africa, the exotic Islands of Zanzibar, the finest game sanctuaries of Serengeti National Park, Tarangire National Park, Lake Manyara National Park, Ngorongoro crater, Ruaha,Selous Game Reserve, the Marine Park of Mafia Island, Breathtaking Coasts and Lake Zones and gently undulating highlands that are a hiker’s paradise. Travelers that have visited Tanzania have appreciated its scenery, topography, very friendly people recommending it as one of the best safari places to visit and the best for wildlife photographic safaris on the continent. Quad biking is one of the best safari activities that a traveler can add in their itinerary on their Tanzania wildlife safari. Quad biking safaris in Tanzania are done at the Zanzibar Island. 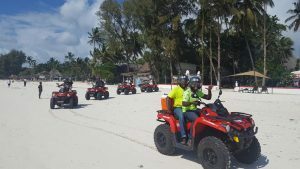 The Quad bike adventure is led by a professional guide as you ride on your own off-road quad to explore Zanzibar’s inland areas Discover the wonderful sites, beautiful landscapes and meet the friendly people. Enjoy the trip with an experienced knowledgeable English-speaking guide. The Quad adventure guide will take you to the south and north caves where you will see the incredible rock formations. As part of your adventure, you will get the best first-hand sights of the real Zanzibar everyday life, spot the sugar cane, pineapple plantations and paddy rice fields. Come across coconut palms, baobab trees and spice, and fruit plantations. The Quad bikes are very ideal for going through the countryside to see how the locals live and work their lands. 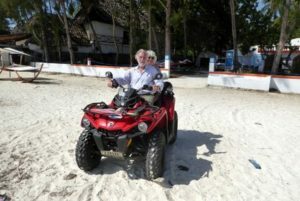 The Quad Bikes used on this trip are well-maintained 440CC and 550CC, they are easy to drive, completely automatic and powerful enough to climb high grounds and ride off-road. Before the departure for any Quad bike excursions, there will be a short briefing about the procedures and rules of Quad biking. During the excursion we suggest to wear sun glasses, plain clothes, bandanas, sport shoes, trousers. You can tailor your Tanzania safari to feature other safaris like a Uganda safari, short Uganda wildlife safari, Rwanda safari, Uganda gorilla trekking safari, Kenya wildlife safari, Rwanda gorilla trekking safari , Congo gorilla safaris, a Jinja day trip, Kampala city tours, Rwanda wildlife safaris and many more.